Captain BAMF L Jackson Seriously, there's no better pirate name than that. Does miniklingon belong in this group? Allons-y!s Will, I'm just your typical easy-going college student with aspirations of world dominat....lol I'm random. period. I'm pretty laid back and have patience a country mile long, but for your own safety don't burn through it. I guess I joined because pirates freakin rock! "Take what you can and give nothing back!" Does lunarwind7 belong in this group? Does finalrequiem belong in this group? Pirates, Aar! 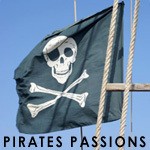 From plundering that there treasure to being on the open sea, its the pirate's life for me. (Don't tell anyone I'm a pirate because its too risky). Just kidding. I do love pretty much anything involving pirates. I love pirate movies. Does beastryan belong in this group? Does wolfx belong in this group?